April 2, 1958. Paramount Theater, New York City. It is the première of The Young Lions. As the lights dim and the film’s opening credits appear, applause bursts at the sight of the names of the film’s stars: Marlon Brando, Montgomery Clift, Dean Martin. In his seat, Montgomery Clift is anxious. He believes the future of his career depends on this film and his performance. Privately, he believes, knows even, that his portrayal of the sensitive Jew Noah Ackerman is his best, even going so far as to expect his fourth Oscar nomination (and his first win). But he is also unsure because he knows what he has done is risky. 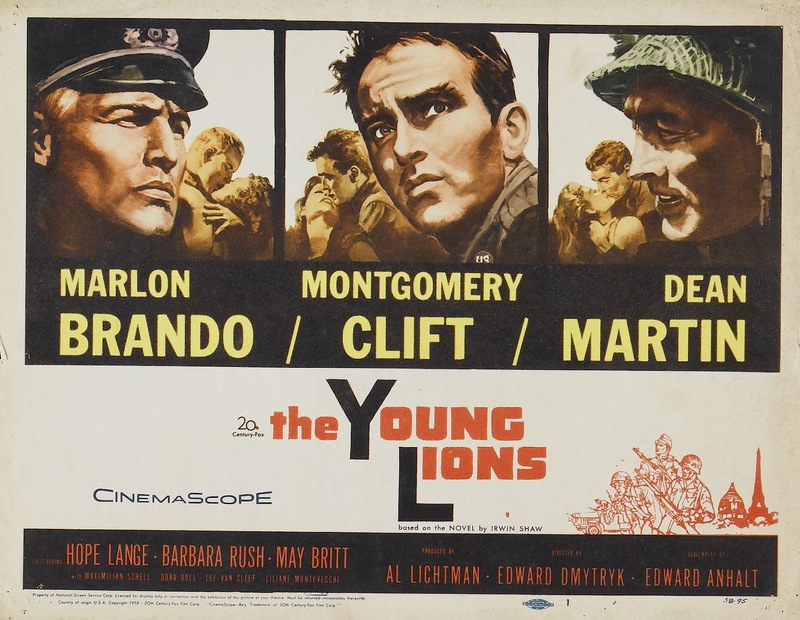 The Young Lions is his first full film after his disfiguring car accident in 1956 (which occurred amidst the filming of Raintree County, requiring an especially watchful eye to be able to discern which shots are pre-accident and which are post-accident), and he has attempted to develop the character of Noah Ackerman using a minimum number of tight shots. Thus, the audience often sees Noah at a distance or an angle, and yet, due to Clift’s extraordinary gift and skill as an actor, Noah’s experiences, perceptions, and feelings are palpable. When that audience in Paramount Theater first sees Clift as Noah, however, there are audible whispers, expressing a mixture of shock and pity, “Is that him?” A girl in the balcony even screams and faints. Clift tenses but remains immobile, staring blankly ahead as the film continues to unfold. The Young Lions tells the story of three soldiers and their very different experiences in World War II. There is Marlon Brando, with his hair dyed blonde and a German accent, as Christian Diestl, who is introduced as decent ski instructor hopeful that the reign of Hitler will bring him a better life who later becomes a Nazi officer, yet, by the war’s end, he has become disillusioned with it all. There is Dean Martin as Michael Whiteacre, a singer/actor who becomes a reluctant participant in the war, explaining his contempt of the war to his girlfriend, “Look, I’ve read all the books. I know that in 10 years we’ll be bosom friends with the Germans and the Japanese. Then I’ll be pretty annoyed that I was killed.” And then there is Montgomery Clift as the sensitive, awkward, and proud Noah Ackerman, a Jew who faces anti-Semitism from the men in his own company. When discussing Clift, the discussion often involves a discussion of two different actors: the pre-accident Clift and the post-accident Clift. I resent this. He looked different, yes. He looked older and exhausted at times. The breathtaking beauty that had captivated and mesmerized movie audiences beginning with 1948’s The Search had been altered–some may even argue it had vanished–but he was still handsome, and he was still captivating and mesmerizing, only now there was no confusion as to whether it was his preternaturally beautiful face doing the captivating and mesmerizing: it was now purely his acting prowess. While it may be easy to point to Clift’s car accident as the cause for the change in his appearance in The Young Lions that startled that audience at the Paramount Theater on April 2, 1958, that is only partially responsible. The accident had made it difficult for him to move his upper lip and rendered the left side of his face practically immovable. Clift, however, had made the deliberate choice to alter his appearance further to personify the awkward and proud Noah Ackerman more fully. He reduced his already thin frame from 150 pounds to a mere 130 pounds, allowing for his clothes to hang loosely. He also distended his ears, and he augmented his nose with putty. The result was a total embodiment of the character. The back of the case of the DVD touts Brando’s character and performance–how it was a controversial role, how Brando makes the German tragic and sympathetic. That is tantamount to blasphemy. 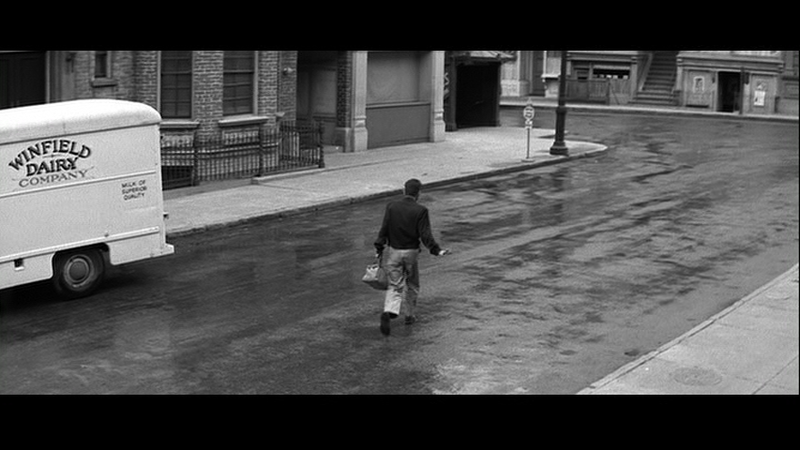 This film belongs to Montgomery Clift. (Still love you, Brando.) His scenes are more vivid, authentic, and human. I love how he shyly walks home with his future wife Hope (played by Hope Lange) for the first time, impulsively kisses her, leading to Hope reprimanding him, and he sheepishly walks away, only to turn back and tap incessantly on the window to ask for directions home. “You’re lost?” Hope asks him skeptically. “No one will find me again,” he answers. “Ever.” His delivery is perfect. I love how he walks around town with Hope’s father, who admits he has never known a Jew and has reservations about allowing his daughter to marry one. Hope’s father points out his connections to the town and its people, eventually leading Noah to their family plot where seven generations of their family are buried. Noah interrupts him, “Mr. Plowman, I don’t have a family plot. I don’t have a family. I earn $35 dollars a week, and I’m 1-A in the draft. But I love Hope, and I shall love her for all my life.” Perhaps I love most of all how he says goodbye to Hope, now his wife. He kisses her, and then begins to walk down the street. He turns around half-way, hoping to see her once more, but he can only bare to stare for a few seconds. He slowly turns and begins to walk again, and he lifts his right hand in an effort to wave, but he only manages to raise it to his waist and give a small wave. It is pathetic and heartbreaking and very real. Clift’s eyes were always his best feature, and he continued to use them to full effect. Only, it seems, that after the accident (and here I am, contradicting myself, speaking of post-accident Clift as a separate being) his eyes expressed more vulnerability, more longing, more pain, more hope, more happiness. They are, in short, even more expressive and powerful than they ever were, if that is possible. In a scene where Noah speaks with his wife in an army prison, it is not the dialogue that makes the scene so effective and poignant (although I love the way he bends back down to whisper “I love you”), but it is instead Clift’s facial expressions, how he uses his hands, and his eyes. Oh, the eyes have it, I tell you. You don’t even have to know the specifics of a conversation between an army Captain, a German mayor of a neighboring town, and a Jewish rabbi asking to hold memorial services for those who have died in the concentration camp. You see it all reflected in Clift’s eyes, his face, the posture of his body. The Young Lions isn’t necessarily a flawless film, but it is a very good one. What makes it such a rewarding movie-watching experience for me, though, is Clift. His acting is not hollow or lackluster, and he does not wander through the movie in a glassy-eyed daze. Rather, he is fascinating, expressive, and you cannot take your eyes off of him, for fear you might miss some nuance–like the little wave of his right arm as he turns away from his wife for what could be the last time–that makes his Noah Ackerman that much more vivid and real. Clift was right when he declared that he couldn’t have given more of himself to the character of Noah Ackerman. I’m not sure he was right when he said it was the best performance of his life–he had far too many outstanding performances to make that distinction so easily. What a great performance Noah Ackerman was, though. What a great actor. My favorite. 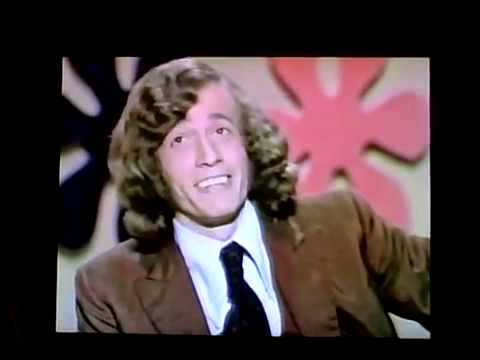 We live in a world where Robert Redford’s face exists, radiating light and beauty, Jonathan Frid was Grand Marshal of at least one parade, and, in 1968, twin brothers Robin and Maurice Gibb were contestants on an episode of The Dating Game–and, 45 years later, we are able to watch that episode via the Internet. (Thank you, Chaplinssmile1 for recording your television and uploading this gem! You are a star.) We live in a wonderful, wonderful world. The gist of The Dating Game is this: There is a single contestant and a panel of three bachelors. The contestant and the panel do not see one another, and the contestant asks each member of the panel individual questions. Based on the answers to these questions, the contestant selects which bachelor she would most like to date, and the show supposedly sends them on a date. Left: Bachelor #1, Maurice “Mo” Gibb, Right: Bachelor #3, Robin “Hunky” Gibb. Not pictured: Bachelor #2, Some Olympian Whose Last Name Is Not Gibb. I think its no mystery whom I would pick. Ha ha. But who will the contestant, Debbie, pick and what kind of questions will she ask? The first question Debbie asks Bachelors 1 and 2 is: What do you like most about the dark? “Well, I love gathering lilacs in an old brown shoe. Basically. In the dark,” Mo answers nonchalantly. Ummm….WHAT? I know it was the ’60s and everything, but did contestants not have to pass a drug test to be on this show? Seriously. What the heck, Debbie? You are so weird. Robin, though, is good-natured about it, and says he would join in. When pressured by Debbie to define what exactly he would do in order to fit in, Robin tells her that it wouldn’t really matter what he did with a family like that–he could do just about anything. You tell ‘er, Robin. “Get me out of here!” Me too, Mo. Me too. “You’d be a rose and I’d water you,” Mo replies. Can you believe this guy would one day write “Closer Than Close”? I think Mo must have borrowed Robin’s sass for this show. This girl is so weird. W-E-I-R-D.
Debbie now has 60 seconds to decide which bachelor she would most like to date. Who do you think she will pick? Let’s review. There’s Mo, who has appeared quite disinterested in the whole thing. His answers have bordered on caustic, but since he’s a Gibb, you know there’s no real malice. Then there’s his twin brother, Robin, whose speaking voice even closely resembles that of an angel. His answers have been polite and well-thought-out. And then there’s some other guy but he is OBVIOUSLY not even in the running because what chance does he stand against TWO Gibbs? Zero chance, that’s what. 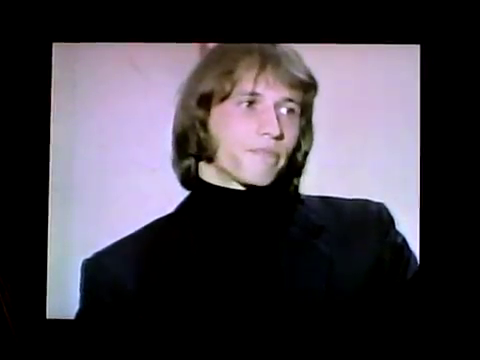 Bachelor #1, Maurice Gibb! He is absolutely chuffed. The host tells this story about rocks and how Debbie and Maurice are going to this place where special rocks are discovered–the diamond mines of Johannesburg, South Africa! Okay, never mind that this is a bit over-the-top for a first date, WHY would anyone going on a date with Maurice “Mo” Gibb need to go anywhere but MOTOWN? Honestly. This show is weird. I’d really like to know if Debbie and Mo ever went on that date to South Africa. Debbie, the world is waiting for your tell-all.